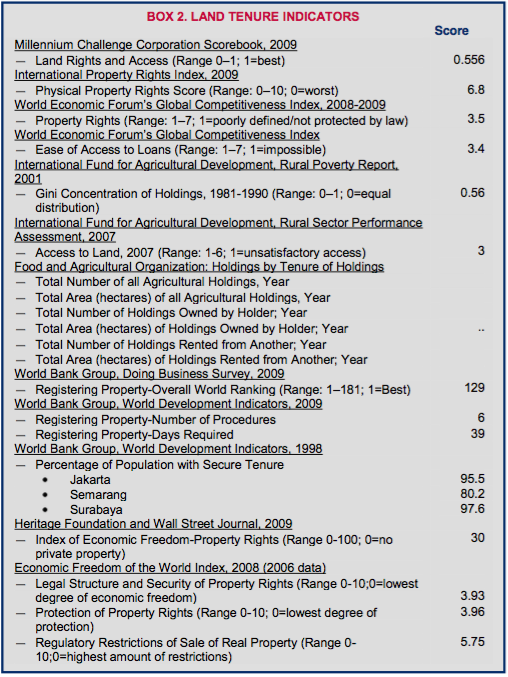 Indonesian development policies have for the past several decades focused on rapid economic growth, without a targeted strategy to benefit the least powerful groups, such as landless and land-poor agricultural laborers in the densely populated agricultural districts and the equally poor forest-dwelling communities in the less populated islands. Indonesia’s legal and regulatory framework governing land is flawed and in need of a comprehensive overhaul. Throughout the country, the land rights of unregistered owners are insecure, women’s rights to marital property are generally not registered, and registration of all rights is unnecessarily expensive. A deforestation rate of 2% per annum is a significant ongoing threat which imposes especially high costs on traditional adat communities that depend upon forest resources for their livelihood. Indonesia’s legal framework fails to provide an environment conducive to investment and economic growth that would open doors of opportunity for the poor, women and traditional communities. At least five land and natural resource property-rights issues should be addressed for the benefits of growth to be more widely shared and to increase environmental sustainability. First, ambiguities between formal and customary law are interpreted by governments, officials and citizens in ways that undermine land rights, leading to a growth in land disputes and conflicts which must be addressed. Second, a registration system that is overly complex, inefficient and ambiguous has weakened security of tenure and the development of a functioning land market. Third, land conversions driven by economic development are threatening Indonesia’s vital forest resources and hold implications at the global, national and local levels, particularly related to climate change. Fourth, urban growth has not been accompanied by sufficient investments in housing and urban services despite continuing decentralization. Fifth, the problem of rural landlessness has limited the economic options, basic livelihood strategies and food security of millions of families. The current era of decentralization of central government functions could be an opportune time to work with district (kabupaten) governments on various land tenure and natural resource property issues. The National Land Agency (BPN) has long resisted reforms and does not appear likely to embrace them, while some district governments may be more amenable to reforms that they see as responsive to the needs of their communities. This could also be an opportune time to engage with civil-society organizations that have an interest in agrarian, natural resource and legal aid matters, but which may not have sufficient technical capacity to design and promote specific legislative reforms. While adat or customary law is declared a primary source of land law, it is simultaneously subjected to all restrictions of formal land law. This ambiguity remains problematic. Donors could support the development of legislation that clarifies and reduces conflict between customary and formal laws. This could include support for kabupaten legislation that recognizes the validity of currently unregistered land right derived from original rights. Insecurity of tenure in both urban and rural areas has been exacerbated by a cumbersome and complex land registration process, lack of clear rights and procedures for registering communal rights, and nontransparent expropriation procedures. Donors could support positive reforms in Indonesia’s land administration system including: 1) work with kabupatens to eliminate or greatly reduce fees for first-time registration of land rights in registration systems administered by kabupaten governments and ensure that women’s names are included in titles; 2) work with kabupatens to conduct community-level spatial planning and develop processes for identifying, describing and registering the communal land rights (hak ulayat rights) of adat customary communities; and 3) work with kabupatens to adopt local guidelines for implementing expropriation procedures in a more transparent and less arbitrary way. Conversion of land use, particularly in forest areas, for palm oil, pulp and mining poses a significant threat to forest resources that are vital both domestically and globally. Donors could build upon Indonesia’s recent commitments to reduce carbon dioxide emissions and to conserve forest habitats and wildlife by supporting coordinated reforms to the political and legal frameworks at both national and local levels, enhancing knowledge of both the status and importance of forest resources, and strengthening government institutions in the forestry sector. Indonesian cities are changing rapidly. Environmental conditions have deteriorated, particularly in areas where rapid population and economic growth have increased the demand for urban infrastructure and services. The rising demand for urban land reflects the rapidly growing economy of some cities. Good urban governance is a prerequisite to sustainable development and urban poverty reduction. Donors could build upon the continued trend of decentralization to promote greater stakeholder participation, including from the private sector and the poor, in urban planning. Donors could support governance systems and planning measures that emphasize environmental sustainability, provision of adequate housing with security of tenure, support for capacity-building in urban management and governance and greater financial responsibility at the local government level. Landlessness continues to deepen rural poverty and food insecurity in the wake of expanding plantations and indiscriminate awarding of forest and timber concessions and mining. Providing landless households with even fractional hectare micro-plots for producing food and raising livestock can significantly supplement their diets and incomes. Donors could build upon the ongoing work in civil society to ensure that access to land, agrarian reform and sustainable development for the rural poor are addressed in national and regional development agendas. In addition, donors could support pilot programs to acquire, at market rates, land sufficient to provide families of landless agricultural workers with small plots, as well as provide access to inputs such as public services and education. The legal and regulatory framework governing land in Indonesia is flawed and in need of a comprehensive overhaul. The legal framework fails to provide an environment conducive to investment and economic growth that would open doors of opportunity for the poor, women and traditional communities. Development of sound policies and laws acceptable to citizens and civil-society groups, and also acceptable to the bureaucracies that must implement them, is an imposing task. In the current era of decentralization of central government functions, the design and implementation of sound land policies poses unique challenges which Indonesian planners are just beginning to address. The Government of Indonesia’s focus on rapid economic development during the 1960s through the 1990s did not produce the same level of benefits for all segments of the population. In particular, landless and land-poor agricultural laborers in the densely populated agricultural islands and forest-dwelling communities in the less populated islands were often neglected. This situation has persisted into the 21st century. Rural landlessness remains a significant problem, especially on Java. Throughout the country, the land rights of unregistered owners are insecure, women’s rights to marital property are generally not registered, and registration of all rights is unnecessarily expensive. Rules on government expropriation are ambiguous and do not fully protect private rights. According to joint World Health Organization and UNICEF 2010 statistics, 28.4% of urban households have access to tap water and 37.8% have access to protected groundwater. In rural areas, only 6.7% have water piped into their dwellings and 41.3% have access to protected groundwater. The Government of Indonesia (GOI) is working to address water resource problems, including unsustainability of water quality and quantity and challenges related to development and management of government agencies responsible for water management at the central and regional levels. Deforestation is a significant ongoing threat in Indonesia. The removal of forests imposes especially high costs on the traditional communities (organized along principles of customary law known as adat) that live in the forests and depend upon forest resources for their livelihood. The land rights and natural resource rights of such traditional communities cannot be registered and are generally unrecognized by the state. Indonesia is a leader in the global mining sector. Policy and regulatory uncertainties and overlapping land-use and property rights in general have created conflicts between mining and forestry concerns, between central and local governments, and between mining interests and local communities. Indonesia is a nation of 17,508 islands (6000 of which are populated), occupying 1,905,000 square kilometers of land. Of this, 26% (476,000 square kilometers) is classified as agricultural. Approximately 49% of the nation (909,070 square kilometers) is covered by actual forest, although the government classifies 69% of the land area (1,331,270 square kilometers) as forest. This discrepancy is largely the result of the Ministry of Forestry’s refusal to reclassify lands that have long since been occupied for cultivation or other non-forest uses. Such refusal is presumably motivated by a reluctance to cede authority over land to other ministries. Approximately 12% (60,500 square kilometers) of agricultural land is irrigated, and approximately 23% (209,030 square kilometers) of actual forest is classified as protected nature reserves. Deforestation is occurring at a rate of 2% per year (World Bank 2009; Contreras-Hermosilla and Fay 2005). Indonesia is the world’s fourth-most populous nation, with a 2008 population of 228,248,000. Of the total population, approximately 49% is rural. As of 2006, 130 million people live on Java, which occupies only 2.5% of the nation’s landmass. Java is the most densely populated island in the world, with an average population density of 940 people per square kilometer (as compared to a national average of 134). Other large islands include Sumatra, Borneo (shared with Malaysia and Brunei), Sulawesi and New Guinea (shared with Papua New Guinea). Indonesia comprises hundreds of distinct cultures and languages. The national language, Bahasa Indonesia, is spoken by almost all Indonesians, usually as a second language. Indonesia is the world’s largest Muslim nation: 86.1% of the population are Muslim, 8.7% are Christian, 1.8% are Hindu and 3.4% are Buddhist or other (World Bank 2009; USAID 2009a; UN 2009; Calder 2006; Encarta 2006; CIA Factbook 2009). 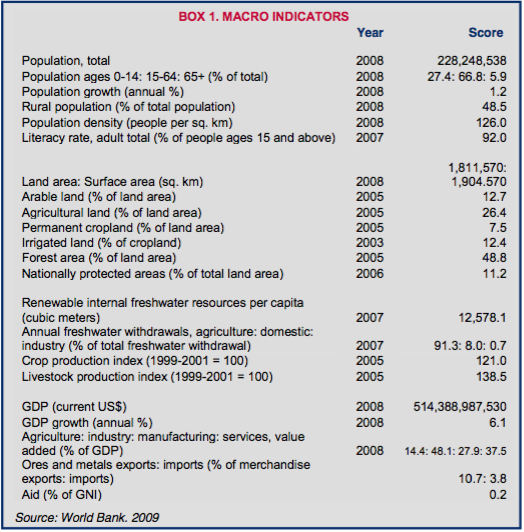 GDP for 2008 was US $514.4 billion. The economy is comprised of (approximately) services (37%), industry (48%), and agriculture (14%). Although agriculture is the smallest producing sector, it employs 44.3% of the workforce. Roughly 17% of the population lives on US $1 per day or less; the proportion rises to 41% in Papua and 26% in Maluku. Nationally, the proportion is higher in rural areas (20%) than in urban areas (13%) (World Bank 2009; World Bank 2007a). Sophisticated rice-paddy terraces have been operated in parts of the country for hundreds of years and are particularly well developed on the islands of Java and Bali and large parts of Sumatra. Many less populated islands remain densely forested and are home to forest and coastal communities that sustain themselves through agriculture (including swidden or slash-and-burn agriculture), hunting and gathering, and fishing. Many remote forests are also home to a significant range of native animals and plants. Indonesia ranks first in the world for number of mammals, palms, swallowtail butterfly, and parrot species (Rhee et al. 2004). Conversion of land uses has had significant impact on natural resources, particularly in Indonesia’s forest lands. Between 2004 and 2009, the Forestry Ministry allocated 1.2 million hectares of forests for mining activities and plans to allocate a further 2.2 million hectares of forests between 2010 and 2020. It is estimated that approximately 550 million tons of carbon will be released into the atmosphere if these plans move forward. Palm oil production is also a main factor in changes in forest land uses. In 2008 the country’s crude palm oil (CPO) production reached 19 million tons, and Indonesia now controls 14.3% of the world’s vegetable oil market. In 2009, Indonesia’s CPO production exceeded 20 million tons. While 9.7 million hectares of land are licensed for oil palm estates, 7.9 million hectares have already been planted. It is estimated that the establishment of 66% of all currently productive oil- palm plantations involved forest conversion (Jakarta Post 2009a; Jakarta Post 2010). As urban boundaries expand, conversions of agricultural land for commercial and industrial uses have increased. The urban population is expected to expand by 70% between 2005 and 2030, fueling the expected conversion of approximately 5000 square kilometers of farmland (mainly productive) into urban uses over the same time period. For example, newer industrial facilities have been constructed on arable rice fields. Growth boundaries for cities and towns have often expanded in a haphazard way, rather than per spatial-planning laws and regulations, and speculative considerations have factored strongly in many land-use conversions (ADB 2006). Competition over access to land is a source of conflict in many parts of Indonesia, especially on more densely populated islands. Conflict over control of cropland (and former cropland) often relates to land that the government seized from individuals and communities during the New Order regime (1965–1998) and allocated to corporations to establish plantations. The desire of farmers for greater access to land is often accompanied by community resentment regarding past government land-takings (Wiradi and Suhendar 2002). Access to adequate amounts of agricultural land has long been a problem for Indonesian farmers and agricultural laborers. The proportion of landless and land-poor agricultural households is especially high on Java. According to government data, of the approximately 17.3 million families on Java characterized as farmer or agricultural laborer households, roughly 39% (6.7 million families) neither lease in nor own any cropland, and another 44% (7.6 million families) lease in or own less than 0.5 hectares. Thus, fully 83% of Javanese agricultural families either work as laborers or cultivate less than 0.5 hectares (BPS 1993a; BPS 1993b). In the early 1960s, Indonesia attempted to remedy the disparity in access to land by redistributing holdings that exceeded ownership ceilings and land held by owners who lived outside the district where the land was located. The program redistributed only a small amount of land and benefited only a small part of the population. The Government abandoned the program in the wake of a 1965 Communist-led coup attempt followed by broad violence directed against citizens believed to be associated with the Indonesian Communist Party (Mitchell et al. 2004). The most important legislation governing land rights is the Basic Agrarian Law (BAL or UUPA), Law No. 5 of 1960. The BAL defines the fundamental types of rights that may be held by private individuals and entities, and describes the role of the state with regard to its direct use of land as well as its regulation of private rights and private uses of land (Mitchell et al. 2004). MPR Decree No. IX of 2001 on Agrarian Reform and Natural Resources Management is another potentially significant piece of legislation. Under this decree, the highest house of the legislature (the MPR, Majelis Permusyawaratan Rakyat) instructs the main house, sometimes referred to as the House of Representatives (the DPR, Dewan Perwakilan Rakyat), and the president to harmonize laws related to use of land and natural resources to promote equity, human rights and sustainable development. For the most part, the specific instructions in the decree have not been implemented (Thorburn 2004). The question of customary land law in Indonesia is especially complicated. Article 5 of the BAL states that that Indonesia’s agrarian law is adat law, or Indonesian customary law, as long as it does not conflict with national interests or other regulations set out in the BAL. However, adat is essentially a communal approach to regulating land rights, including land rights exercised by individuals with the consent of the community, and adat varies widely across the archipelago, sometimes even over short distances. The new forms of private land rights set forth in the BAL (described below) are a kind of Western categorization of land rights that, though they have parallels with some adat systems, can hardly be considered customary rights. Moreover, the BAL does not deal with many of the less individualistic land tenure types, and does not address customary systems that regulate access to land. It is therefore probably more useful to think of the BAL as ultimately directed at the individualization of land tenure in Indonesia (Fitzpatrick 1997; Lindsey 1998). Article 3 of the BAL gives weak recognition to continuing communal adat land rights, known as hak ulayat, but only so long as the rights evidently still exist and only if the rights are in line with the national and the state’s interest based on the unity of the nation. In addition, adat land can only be registered, and hence certified, after having been rendered into one of seven private law land rights recognized in Article 16 of the BAL (Bakker 2008). Thus while adat is declared a primary source of land law, it is simultaneously submitted to all restrictions contained in the BAL. This ambiguity remains problematic (Bakker 2008). The drafters of the BAL envisioned adat to gradually adapt to national law or be absorbed and replaced by it. Perhaps because of this, or because these rights are considered incompatible with economic development, and because the communal nature of the rights is fundamentally at odds with individualization of title, the Indonesian state has for several decades been hostile to the continued existence of hak ulayat. Hak ulayat is a legal term connoting communal rights of an (ethnic) community to land based on that community’s adat. The 1967 Basic Forestry Law essentially rendered all forest land the property of the state and eliminated adat rights for those Indonesians most likely to be practicing hak ulayat and other forms of adat. Thus, while hak ulayat may continue to be observed as binding within communities, it is essentially not recognized by the state. This conflict between customary and formal law rose to prominence in local politics when Indonesia’s government decentralized administrative authority to the district/municipality level in 1999 (Lindsey 1998; Bakker 2008). Under Laws No. 22 and No. 25, which provide the framework for political and financial devolution, the districts and cities assume new responsibilities that were previously covered by the national government as well as manage financial resources that have been transferred from the central government or raised within their own localities. Land affairs are among the responsibilities devolved to the regional government under Law No. 22 of 1999 (Bakker 2008; Asia Foundation 2002). Concerns surrounding Indonesia’s decentralization policy are centered on the lack of legal clarity to support its implementation at the provincial level, particularly as it relates to settling land conflicts. On the fiscal side, most of the local governments are highly dependent on transfers from the central government. The tight fiscal situation leaves little room to initiate programs for development. Furthermore, the importance of the provincial government’s roles and functions are not clearly elaborated in the decentralization laws (Laws No. 32 and 33 of 2004). While the revised Law on Local Government in 2004 has given local governments more autonomy, the creation of local laws and regulations is often in contradiction with national laws. Parallel sets of customary (adat) laws can make citizens’ rights even less clear (Sitomorang 2010; Bakker 2008). In response to the growing need to coordinate land-management processes, the Indonesian parliament passed the Spatial Planning Law (Law No. 24 ) in October 1992 which was amended by a later Spatial Planning Law (Law No. 26 of 2007). The 1992 law defined spatial planning and provided the guidelines of plan- making processes, plan implementation and development control for national, provincial and local levels. It also stipulated the principles of spatial planning in Indonesia to include integrity, sustainability, effectiveness, efficiency, compatibility, harmony, openness, equality, justice, and legal protection. The 2007 law is in accordance with the decentralization laws and stipulates explicitly the authority of provincial governments (pemerintah propinsi) and of district governments (pemerintah kabupaten and pemerintah kota) in spatial planning. Spatial Planning Law No. 26 also takes into account the rapid urbanization occurring in Indonesia, particularly in the Greater Jakarta Area. The concepts of metropolitan area and megapolitan area are introduced in the new law. Such concepts were not parts of the previous spatial planning law (Rukama 2008) . The BAL vests control of all land in the state, but also recognizes private ownership. When pressed, government officials hold that unregistered land is owned by the Indonesian people, but also acknowledge that the state controls such land for the benefit of the people. In essence, the state holds radical title to all land in Indonesia. Although government officials would strenuously contest this assessment, this notion of state control perpetuates the concept of domein, a basic element of land law during the Dutch colonial period. The domein concept continues to make it difficult and expensive for citizens to register previously unregistered rights that are based on individual adat claims (ROI 1960; Mitchell et al. 2004). The BAL sets forth the main forms of tenure that can be registered. These include: hak milik (right of ownership), which is unlimited in time and capable of being transferred and mortgaged; hak pakai (use right), which applies to possessory rights, such as usufruct, that do not have a permanent quality; hak guna usaha (right to exploit), a kind of agricultural commercial lease; and hak guna bangunan (right to build), which applies to rights to construct and use buildings. These rights are not available to foreigners, although some foreigners enter into contracts with Indonesians or establish Indonesian companies to hold land rights (Lindsey 1998; Fitzpatrick 1997). Agricultural land holdings may not exceed limits imposed by Basic Regulations on Agrarian Principles and Government Regulation in Lieu of Law No. 56 (1960) On Stipulation of the Size of Agricultural Land. Government Regulation No. 224 (1961) On Implementation and Redistribution of Land and Provision of Compensation provides a process by which the state will expropriate above-ceiling and absentee lands and redistribute these to tenant farmers and others (Roth 2006). Hak ulayat (which can be translated as a communal right of alienation) cannot be registered. Hak ulayat is further discussed below (See Trees and Forests) (Contreras-Hermosillo and Fay 2005; Lindsey 1998). Systematic land registration is ongoing in Indonesia. Over the last 40 years, BPN and its predecessor agencies registered roughly one-third of the country’s privately held land parcels, leaving an estimated 60 million unregistered. In recent years, BPN has registered an average of roughly 1 million parcels per year. At this pace, it will take another 60 years to complete the registry (Mitchell et al. 2004; Thorburn 2004). Since most private rights to urban and rural land remain unregistered in Indonesia, most people presumably acquire their rights to land by inheritance. Although Article 56 of the BAL recognizes the continuing validity of rights derived from adat, or customary law, the right-holder cannot register the right – and the right is not fully recognized by the state – until he or she purchases a stipulation as required by the National Land Agency, confirming that the land is not state land. Thus, although the right originates in adat law, in existence since well before the creation of the Indonesian state in 1947, BPN officials impose a presumption that all unregistered land is state land until proven otherwise (Mitchell et al. 2004; Thorburn 2004). Lease of land is common, especially with respect to prime agricultural land. Although Article 10 of the BAL requires owners of agricultural land to cultivate the land personally, bureaucrats have refused to enforce this provision since the 1960s. Nevertheless, most leases are informal, since the leases are technically illegal. Agricultural land tax is collected from land users rather than owners, with no questions asked by the tax authorities regarding who owns the land. Actual ownership of agricultural land is closely guarded by village officials, and the National Land Agency has no access to ownership records for much of the individually held agricultural land nominally within its jurisdiction (Lindsey 2004; Mitchell et al. 2004). Different communities experience differing levels of tenure security. In settled agricultural or residential areas, people whose families have occupied particular land for generations usually have documents showing payment of land taxes or documents showing that they or their ancestors purchased the land. Such people are likely to feel relatively secure, as was found in a recent study of farmers in Sulawesi. In areas where systematic titling of rights is performed, there is often a high demand for land titles, but it is not clear if this is the result of tenure insecurity per se. Where systematic titling is not undertaken by the state, citizens may find it difficult and expensive to register their rights (Nielsen and Safik 2007; SMERU 2002; Thorburn 2004). Forest dwellers who might wish to assert rights of hak ulayat have almost no tenure security. Hak ulayat rights cannot be registered, and although there is a process on the books by which the state can recognize such rights, this is seldom done. Nor is it clear that the act of recognizing the right prohibits the state from later withdrawing recognition (Mitchell et al. 2004). Although Indonesia claims to have a title registration system, what is in place functions more like a deeds registration system. Registration of ownership is not conclusive evidence of ownership, but instead serves as strong evidence of ownership. The legal effect of registration is established by the BAL, but the process for registration is governed by Government Regulation No. 24 of 1997 On Land Registration, which provides for: (a) systematic registration, in which rights to a large number of contiguous parcels are registered in a public process involving neighboring owners and (b) sporadic registration, in which a single right-holder applies for registration. The average unit cost of sporadic registration is considerably higher than that of systematic registration. Both methods typically use ground survey methods. There is great opportunity to reduce the cost of systematic surveys through use of aerial photography to locate boundaries (Brown 2003; Mitchell et al. 2004). The BAL is generally interpreted to allow owners to transfer their ownership rights through civil agreements even though rights of the transferor and transferee are not registered either before or after the sale. This loophole reduces incentives to register land rights (Hendriatiningsih et al. 2009). Research on Java reveals that very few titles are being issued in the names of both husband and wife during ongoing systematic registration. About 65% of new titles are issued in the names of men, 30% in the names of women, and only 5% in the names of either husband and wife or siblings. Land rights are generally titled in the name of a woman only when the land is her separate property, while marital property is usually titled in the husband’s name. Although joint titling is allowed, married couples are usually not informed that this is an option, and many registration officials are not sure it is allowed. Other research found even lower levels of joint titling (3%) and registration in the woman’s name (17%) (Brown 2003; SMERU 2002). The 1974 Marriage Law provides that property purchased during marriage shall be co-owned by husband and wife. Property purchased prior to marriage or acquired by gift or inheritance remains the separate property of each spouse. There are regional differences. For example, women on Java are sometimes registered as owners (see above), whereas in other regions, such as Southeast Sulawesi and the islands of Nusa Tenggara Timur, women generally hold neither individual nor joint rights to land, deriving their rights through a husband or male relative (Lastarria-Cornhiel et al. 2003; Nielsen and Safik 2004). Islamic law governs inheritance in the case of Muslims, and the Civil Code governs in the case of non-Muslims. Again, there are regional differences. In rural Java, families (including Muslim families) tend to follow Javanese custom in dividing land equally among sons and daughters, rather than allocating half-shares to daughters in accord with Muslim tradition. In South Sulawesi and the islands of Nusa Tenggara Barat, polygamy greatly complicates inheritance (Brown 2003; Nielsen and Safik 2004). Custom – and its impact on women’s land rights – varies widely across the archipelago. On Java, women can own land, and land is sometimes registered in the woman’s name (see above). In other regions women are customarily not entitled to own land (Brown 2003). Although not all local custom provides land rights to women, where custom does allow such rights the rights are protected. For example, where women hold land rights to marital property, as on Java, they report that their husbands usually consult with them before any major decision is taken regarding disposition of the land. This is true even when the marital property is registered only in the husband’s name. In addition, Land Deed-Making Officials (a kind of public notary) must, when preparing transfer documents, determine whether land is marital property, and if it is, they must obtain the consent of both spouses. Similar protections are provided by court process in the case of divorce or death (Brown 2003). Until recent years, the National Land Agency (BPN), which maintains offices in every province and district (kabupaten) of the country, has been solely responsible for determining the status of, allocating, registering and regulating all land classified as non-forest. In the new era of decentralization, some of these responsibilities and powers are being assumed by provincial government structures charged with land administration. Land classified as forest land (including land without tree cover) is administered by the Ministry of Forestry. Provincial governments are increasingly demanding a greater say in managing forests within their regions (Thorburn 2004). During the New Order regime (1965–1998), imposition of a uniform administrative structure throughout the country’s villages weakened the ability of local communities to govern themselves using traditional forms of organization. Although regional autonomy laws adopted beginning in 1999 have restored the possibility of customary authorities taking charge of village affairs, this has occurred only in scattered parts of the country (Thorburn 2004). Land is relatively scarce on the most populated islands, such as Java, Bali and parts of Sumatra, but relatively abundant across much of the country. Government approval is not necessary for sale or mortgage of land, and no approval is necessary if the buyer is an Indonesian citizen rather than a legal entity. The government is intimately involved in private development projects and requires the seller to sell first to the government, which then grants long-term use rights to the legal entity that will develop the land (Thiesenhusen et al. 1997). In urban areas, constraints to the functioning of urban land markets include an incomplete regulatory framework that is poorly reconciled between formal and adat (customary) laws and a poorly developed and inefficient land registration system. Indonesia ranks 107th out of 177 countries analyzed with regard to the difficulty of registering private transactions. The average time for registration is 39 days, which is a third of the average time throughout East Asia and the Pacific. However, the cost in Indonesia averages 10.7% of the value of the property, which is three times the average cost in the region (World Bank 2008a; Nielsen and Safik 2007). Weak land administration, a cumbersome formal land-development process, and corruption are further distorting land markets. These conditions encourage sellers and buyers to evade the formal transaction processes and discourage much needed private investments in land and housing development. Credit markets for housing and development are weak (World Bank 2008a). The poor bear the brunt of the current urban land market, and landlessness is increasing, although the extent of landlessness is not known due to lack of data and the prevalence of informal arrangements. The supply of decent affordable housing in urban areas falls far short of the demand, leaving many without homes. Key impediments to improving urban conditions for the poor include: lack of job opportunities; lack of affordable land for urban development; insecure tenure; lack of appropriate land-use planning and development controls; insufficient urban environmental regulations; and lack of affordable and decent housing and settlements (World Bank 2008a; ADB 2006). In rural areas, it can take six to twelve months to register rural land rights, as is the case in Sulawesi. Researchers have found that systematic registration has produced an average increase of 12.8% in the incidence of land being used as collateral and has also led to increased investment in land improvements, especially in rural areas. Others have found that demand for land titles is higher where there is already an active market for land (SMERU 2002; Nielsen and Safik 2007). Land expropriation is not subject to uniform implementation guidelines and ambiguities in the law make the process inconsistent in practice. According to Presidential Regulations No. 36 of 2005 and No. 65 of 2006, the government can expropriate private land for a limited list of public purposes. In practice, levels of compensation paid by the government are low and highly arbitrary, and the regulation does not require payment of compensation to those without documentary evidence of rights (World Bank 2007a). Disputes over land are widespread. In recent years it has been estimated that at least 1500 major land conflicts remain unsettled. Conflicts often involve clashes between communities of farmers on one side and either the Ministry of Forestry or private plantation companies on the other (Thorburn 2004). Ultimately, large-scale land disputes are resolved politically because there is no civil process that is viewed as consistent or legitimate by the disputants. Courts, as opposed to being neutral, remain susceptible to outside political influences. The inadequacy of the current system has prompted calls for the creation of a Land Court (Lindsey 1998; Fitzpatrick 1997). The issue of how to deal with hak ulayat land claims of adat communities living within the jurisdiction of the Ministry of Forestry remains unresolved. Inconsistencies between the BAL and the basic laws governing forests and mining remain (Contreras-Hermosilla and Fay 2005). The national government continues to register land rights under systematic registration programs financed by the World Bank. This registration is basically sound, but the pace remains much too slow to register the remaining private land before the middle of this century (Mitchell et al. 2004). USAID does not presently have any land tenure programs in Indonesia; however, in the past it funded a grant that provided drafting assistance to the National Land Agency (BPN). The grant ended in 2004. USAID supports the application of Indonesia’s new spatial planning law. In Papua Province, USAID supported the preparation and approval of the Provincial Spatial Plan and will also support spatial planning in several kabupatens (districts) under the Indonesia Forests and Climate Support (IFACS) project. IFACS will improve forest management by working with Forest Management Units (FMU) whose community and customary rights to forests will be acknowledged and incorporated into project implementation. USAID currently provides training and other institutional assistance to the DPR and the Attorney General’s Office (USAID 2009b). The World Bank funded the Land Management and Policy Development Project (May 2004–December 2009), which worked with the National Land Agency (BPN) to: (1) develop land policy; and (2) issue land titles through systematic registration. Policy planning has not included participation by high-level officials and so has not led to clear land policy reform. Approximately 1 million titles have been issued, less than one-half of the project’s target (although the planned duration of the project is four-fifths complete). The Bank recently completed a project to title land in Aceh (World Bank 2008b). In recent decades, Indonesian civil society groups have provided an essential counterweight to the bureaucracy in matters of public policy development. With respect to land, active civil-society groups including JATAM-Mining Advocacy Network, Jaringan Advokasi Tambag, Wetland International, and KPA-Consortium for Agrarian Reform Konsorsium Pembaruan Agraria, are organized around agrarian issues, forests and natural resource issues, and legal aid. To be more effective in the arena of land policy development, civil-society groups would benefit from training in the technical aspects of regulating and administering land relations to understand the ways in which bureaucrats and others take advantage of gaps and ambiguities in legislation (Mitchell et al. 2004). Most Indonesian lakes are of volcanic origin. The country is home to the largest volcanic lake in the world, Lake Toba. Indonesia has over 5590 rivers. Total catchment area is estimated to be 1,864,000 square kilometers, and average annual river runoff is estimated to be 2793 cubic kilometers. Municipal and industrial wastewaters are discharged virtually untreated into waterways, causing the quality of river water to deteriorate rapidly. Total dam capacity in 1995 was 15.8 cubic kilometers. Hydropower potential in Indonesia is about 75,000 megawatts (75 gigawatts). As of 2007, installed capacity for hydropower plants was about 4260 megawatts. In 2005, hydropower contributed 12.9 terrawatts to total electricity supply. As of 2005, electricity produced by hydroelectric sources contributed 8.5% of total electricity production (USAID 2007; ADB 2010). Groundwater resources are estimated at 455 cubic kilometers per year, although an estimated 90% returns as base flow to rivers. Groundwater is not sufficient to meet all urban and rural water needs. In some places, such as Jakarta, overexploitation of groundwater has led to critical problems, including the introduction of saline groundwater 10 kilometers inland from the coastline and land subsidence of up to 34 centimeters per year in parts of the city (FAO 1999). In 2007, 91 cubic kilometers of water was withdrawn for agriculture, 8 cubic kilometers for domestic consumption and 0.7 cubic kilometers for industry. As of 2003, total area equipped for irrigation was 12% of agricultural land (World Bank 2009). According to joint World Health Organization and UNICEF 2010 statistics, 28.4% of urban households in Indonesia have access to tap water, and 37.8% have access to protected groundwater. In rural areas only 6.7% have water piped into their dwellings and 41.3 % have access to protected groundwater. In terms of access to sanitation facilities, 75.9% of urban residents have access to flush toilets, and 12.7% use dry latrines. Forty seven percent of rural households have access to flush toilets, while 25% of households use wet latrines and another 25% use dry latrines (WHO / UNICEF 2010). Article 33 of the Constitution asserts that the state shall control all waters in the country. The Law on Water Resources (Law No. 7 of 2004) regulates use of water. Article 6 of the Law affirms the state’s control over all water resources. The Law gives primary consideration to the use of water for daily basic needs, such as drinking, bathing, cooking, washing, sanitation and religious worship. Second priority is given to the irrigation needs of farmers within an existing irrigation system. Licenses are not required, although the government provides certificates to farmers’ groups within an irrigation system (Ma 2007). The Water Resources Law does not establish private ownership of water, but provides rights to withdraw and use water, including use for cultivation. Article 6 of the Law provides that traditional communal rights to use water may be recognized by regional regulations, but the law makes no mention of customary adat. The Law prohibits the trade of water rights (Ma 2007). Water resources are managed by the Ministry of Public Works through its Directorate General of Water Resources Development. The directorate has four primary missions: (1) to help the nation maintain self-sufficiency in rice production; (2) to meet increasing demands for drinking water and water for industry; (3) to alleviate floods and manage rivers; and (4) to develop, conserve and manage water resources (FAO 1999). Publicly managed irrigation systems include; technical systems (characterized by permanent canals and control structures); semi-technical systems (permanent canals with few control structures); and simple systems (few permanent control or distribution structures). In addition, village irrigation systems are developed and managed by farmers (FAO 1999). The main challenges appear to relate to development and management of government agencies responsible for water management at the central and regional levels (Hirsch et al. 2006). The Government of Indonesia is addressing water resource problems and structural deficiencies through the Indonesian Water Vision (2002), which outlines three major considerations for reform of water resources management, including; sustainability of water quality and quantity; the need for achieving food security and sustainable irrigation; and improvement of institutional capacity. The reform’s objectives include: establishment of a national framework for coordinating water resources and irrigation management; adoption and implementation of a national water policy; establishment of institutions and procedures for involving stakeholders and water resources service beneficiaries; and the introduction of a water rights system for water allocation (UN 2004; ROI 2003). The USAID Environmental Services Project worked with communities to secure access to water resources, promote improved water resource management, and increase access to clean water supply and sanitation services. The USAID Indonesia Urban Water, Sanitation and Hygiene (IUWASH) Project will promote community access and rights to water. USAID is also supporting spatial planning for marine protected areas with the Ministry of Marine Affairs and Fisheries (MMAF) and as part of the process will be accounting for traditional marine rights to these areas (USAID 2010). The World Bank’s Water Resources and Irrigation Sector Management Program is an 11-year adjustment program loan that extends and consolidates the Bank’s longstanding support for institutional development. The program’s objectives are: 1) sustainable and equitable management of surface water resources and infrastructure; 2) increased farm household incomes; and 3) more cost-effective and fiscally sustainable management of sector agencies. This reform agenda is also supported by the Asian Development Bank, the Japan Bank for International Cooperation (now merged with Japan International Cooperation Agency) and the Netherlands. In addition, a €10 million grant from the EU supports water basin resources management, water conservation, and participatory irrigation management in the province of Nusa Tenggara Barat (World Bank 2007a). Indonesia has the world’s third-largest area of tropical forests (after Brazil and Zaire). Approximately 48% of the nation is covered by actual forest, for a total forest area of 88,495,000 hectares, although the government classifies 69% of the land area as forest. This discrepancy is partially explained by the tendency of the Ministry of Forestry, decades ago, to classify as forest all lands that were not affirmatively classified as agricultural land, and may also be explained by the loss of tree cover as the result of deforestation. Indonesia contains the most extensive mangrove forest in the world and represents 10% of the world’s remaining tropical forests (Orangutan Foundation 2010). Demand for timber, illegal logging, land conversion, and mining activities have threatened the country’s forests. Domestic demand for timber from Indonesian industries exceeds the supply that can be met from the legal and licensed harvest. This domestic timber shortage is exacerbated by the fact that trading logs on the international market is more profitable than in the domestic market. Currently, however, there is an export ban and tighter controls on Indonesia’s tropical log exports. Of all timber logged in Indonesia, an estimated 73–88% is logged illegally; illegal logging currently occurs in 37 out of 41 surveyed National Parks in the country. Conversion of forests to palm oil plantations has increased exponentially since the early 1990’s. In 2008 Indonesia’s crude palm oil (CPO) production reached 19 million tons and now controls approximately 14% of the world’s vegetable oil market. In Central Kalimantan alone the rate of conversion to oil palm plantations has increased by 400% with almost 3 million hectares of peat lands converted. Finally, much of the most commercially viable mineral ores and metals are found in forested areas, particularly in areas that are categorized as protected forests (Jakarta Post 2009b; Nelleman et al. 2007; Resosudarmo et al. 2009). Indonesia is the world’s third-largest emitter of greenhouse gases. Seventy-five percent of its emissions are a result of deforestation. Forest fires and decomposition of peat lands emit 2000 million tons of carbon dioxide a year. Recent estimates suggest that 98% of Indonesia’s natural rainforest may be destroyed by 2022, with lowland forests disappearing much sooner. In 2003 the rate of deforestation in Indonesia was the highest in the world, reaching 2.4 million hectares per year (FAO 2009; Contreras-Hermosilla and Fay 2005; Rhee et al. 2004). The Forestry Law (Law No. 41 of 1999) replaced the Basic Forestry Law (Law No. 5 of 1967) that had been in effect throughout the New Order period (1965–1998). Other important laws include Laws On Conservation of Biodiversity and Ecosystems (Law No. 5 of 1990), On Management of the Environment (Law No. 23 of 1997), On Spatial Use Management (Law 24 of 1992), and MPR Decree No. IX of 2001 On Agrarian Reform and Natural Resources Management (Rhee et. al 2004). The Constitution does not mention forests explicitly, but does refer to the state’s control over all natural resources of the country. Although the Basic Agrarian Law (BAL, Law No. 5 of 1960) purports to apply to all land in Indonesia; since 1967, the government has regarded all areas designated as forest as being regulated exclusively by these forestry laws (Rhee et. al 2004). The overwhelming majority of forested land in Indonesia is classified as state forest and is therefore controlled by the state. Although the BAL recognizes the customary land rights – called hak ulayat – of traditional adat communities, including communities living in forests, the recognition applies only to communities that still exist, and only if the interests of the community do not violate interests of the Indonesian state. The criteria to determine the validity of a community is set forth in Ministerial Regulation 1999 entitled “Guidelines to Solving Problem of Adat Communities ‘hak ulayat’ ” (Thorburn 2004; Contreras-Hermosillo and Fay 2005). In practice, the Ministry of Forestry has consistently ruled that the interests of the state trump any interests of adat communities to use the trees or the land that the ministry has classified as state forest. The ministry essentially treats all such lands as state lands and freely grants concessions to companies to harvest trees or establish plantations of oil palm or other commercial crops. Today, only a small proportion of forests in Indonesia are on privately titled land (Lindsey 1998; Contreras-Hermosilla and Fay 2005). It has been difficult for adat communities to establish land rights in forests controlled by the Ministry of Forestry. The new era of decentralization of government authority – from the central government to the district (kabupaten) governments – has created more space for adat communities to assert rights to at least receive compensation for the removal of trees from their land. While community-managed forests have been successful in rehabilitating heavily degraded forest areas and generating sustainable income for adat communities, newly regenerated forests have attracted the attention of illegal loggers, who operate with seeming impunity. Local residents, forest advocacy groups and conservationists cite corruption, mismanagement, apathy from local law enforcement and fear among local residents as underlying factors in this growing trend (Contreras-Hermosillo and Fay 2005; Jakarta Post 2010b). Conflicts are common between forest-dwelling adat communities and timber companies and others who want to harvest trees, and such conflicts often turn violent. The basis of all such conflicts is disagreement over the state’s authority to harvest the trees or grant harvesting rights to corporations. Five core factors that motivate and sustain forest-related conflicts are: direct and indirect involvement of the Indonesian formal security and military forces in timber conflict; (2) fragmentation of natural resource management authority due to rapid devolution of political power from the central government to kabupaten authorities; (3) kabupatens’ abuse of their newly evolved political powers; (4) selective and inconsistent law enforcement; and (5) ambiguous land and resource tenure (ARD 2004). Land classified as forest land (including land without tree cover) is administered by the Ministry of Forestry. Provincial governments are increasingly demanding a greater say in managing forests within their regions. The new era of decentralization of powers from the central government to the kabupaten has been marked by confusion and lack of planning. Unclear allocation of authority over forest resources during this period led some kabupatens to adopt short-term forest exploitation practices, partly for revenue and partly as an assertion of control. More recent legislation has clarified authority over forests and has laid the foundation for more rational and sustainable management, with participation of stakeholders. The newly decentralized electoral process enables governments to become more responsive to citizens, but kabupatens need improved capacity for working with the public, identifying and responding to their needs, and running public consultation processes (World Bank 2006b). A study of the impacts of decentralization in the kabupaten of East Kalimantan found that companies wishing to receive harvesting permits from the kabupaten government were required by the kabupaten to negotiate directly with affected adat communities. After decentralization, an average of 94% of surveyed households received payments from companies, as compared to only 1% before decentralization, and villagers were also able to negotiate better non-cash benefits (World Bank 2006b). Although the laws delineating authority between the central government and the kabupatens are gradually becoming clearer, there appears to be no legislative breakthrough on the horizon that would restore and protect the hak ulayat rights of adat communities living in forests (and non-forested areas classified by the government as state forest) (Moniaga 2009). MPR Decree No. IX (2001) on Agrarian Reform and Natural Resources Management does not provide sufficient guidance to the People’s Representative Council and President regarding how to harmonize the resource laws (the BAL and Forestry Law chief among these), and many parts of the decree have largely been ignored. Some bureaucratic elements within the government seem inclined to frustrate attempts at reform (Rosser et. al 2004). Recently the Indonesian government has stated that it would reduce greenhouse gas emission by 26% over the next decade with 14% of this related to deforestation. The government has also recommended a moratorium on peat lands conversion in order to achieve this target (Hance 2010). In 2010, USAID started the Indonesia Forestry and Climate Support (IFACS) Project to focus on improved governance of the forest sector. The project works with Forest Management Units (Kesatuan Pemangkuan Hutan or KPH), partners from the private sector, government, NGOs and community to improve land resources management. Improved land stewardship, rehabilitation of degraded forests, sustainable use of agricultural lands and conservation are components of the program (Business Wire 2010). The World Bank supports projects to limit deforestation and promote community management of forests and community-based plantations. The precise nature and extent of the World Bank’s engagement in the forestry sector is not clear, but there appears to be a focus on working with district (kabupaten) governments. DFID has actively supported the development of progressive forest policy in Indonesia in recent years (World Bank 2006b). The Center for International Forestry Research (CIFOR) has developed The Kalimantan Forests and Climate Partnership (KFCP) with the Governments of Indonesia and Australia to reduce greenhouse gas emissions from deforestation and forest degradation (REDD). The European Union (EU) has been providing support to the Government of Indonesia, the private sector and civil society to create the appropriate enabling conditions conducive to reducing trade in illegal timber and non-sustainable practices in the forestry sector through the 5-year Indonesia Forest Law Enforcement, Governance and Trade Support Project (FLEGT), which concludes in 2010 (CIFOR 2009; EuropeAID 2010). Indonesia is a leader in the global mining sector, ranking second in tin production, seventh in gold production, fourth in copper production, fifth in nickel production and eighth in coal production. Minerals contribute about 10% of GDP. Prospects for discovery of additional mineral deposits are expected to remain high in the future. According to industry investors, regulatory uncertainty and political risk remain the greatest weaknesses in Indonesia’s mining industry (World Bank 2004; Kuo 2008; Business Monitor International 2010). Mining can only be conducted in areas designated by the Central Government as open for mining. Mining areas are categorized as: 1) Commercial Mining Business Areas (Wilayah Usaha Pertambangan, or WUP), representing mining areas for larger scale mining; 2) State Reserve Areas (Wilayah Pencadangan Negara, or WPN) representing areas reserved for the national strategic interest; and 3) People’s Mining Areas (Wilayah Pertambangan Rakyat, or WPR), representing mining areas for small-scale local mining. The areas identified for mining are not designated exclusively for mining and often include other uses, such as forestry (Price Waterhouse 2010). The state explicitly allows members of the local population in possession of a mining authorization permit (or Kuasa Pertambangan) to exploit minerals in areas designated by the Ministry of Mines to have no economic significance. These activities are called people’s mining (pertambangan rakyat) and are conducted by locals on a small scale or in collectives with simple tools, for their own income (Resosudarmo et al. 2009). Between 2004 and 2009, the Forestry Ministry allocated 1.2 million hectares of forests for mining activities. It also plans to allocate a further 2.2 million hectares of forests for mining activities between 2010 and 2020, potentially releasing about 550 million tons of carbon into the atmosphere. The Ministry of Mining and Minerals (ESDM) has issued 1830 licenses with a total concession area of approximately 28 million hectares. Of this concession area, 150 licenses are located in preservation and conservation forests of approximately 11 million hectares (Orangutan Foundation 2010). Foreign mining operations have attracted controversy for several decades. This is especially so for gold mining operations in the province of Papua, which has long been subjected to a low-level insurgency by groups seeking autonomy from the government. As recently as October 2009, a busload of employees of the US company Freeport came under fire and two employees were shot, though it remains unclear whether anti-government insurgents were responsible (CBS 2009; New York Times 2009). Conflicts within the sector are also related to issues concerning human rights, gender, the environment, indigenous people and their property rights, and social justice (JATAM 2010). Article 33 (Sec. 3) of the 1945 Constitution provides that the land, the waters and the natural riches contained therein shall be controlled by the state and exploited to the benefit of the people. Thus, the state controls all mineral wealth of the country and regulates mining in the Basic Mining Law (Law No. 11 of 1967). Article 1 of the Law provides that all minerals in the form of resources shall be controlled and utilized by the state. Mining can be conducted by the state or by enterprises and individuals licensed by the state. Article 11 allows peoples’ mining by the local population, but only upon first obtaining a license from the government (ROI 1967). Law No. 4 of the 2009 Mineral and Coal Mining Law established a new regulatory regime for the sector. The provisions of the law include: (1) changing the regulation of foreign investment from a contract basis to a license basis; (2) opening up the mining sector for foreign investment; (3) vesting authority to designate areas available for mining with the central government in consultation with parliament and regional/local governments (with regional/local government offices holding authority to award the actual mining licenses); and (4) increasing allowable mining area both by hectares and in terms of yearly production (from 20 to 30 years with two possible 10-year extensions). The new law also requires mining companies to seek separate permits for each phase of mining activity (reversing the previous system in which permission for all phases was granted at the time of contracting), and will also require companies to process all mining products into metal locally (Ionasia 2009; AP 2008; Jakarta Post 2008). As with many aspects of Indonesian law, the new law establishes substantive principles to guide the sector, but implementing regulations need to be more fully developed. Such regulations will define foreign investors’ divestment obligations and other processes related to regulations for the procurement of a permit under the new law. Two implementing regulations, Government Regulation on Mining Areas (Regulation No. 22 of 2010) and Government Regulation on the Conduct of Coal and Mineral Mining Business Activities (Regulation No. 23 of 2010) have attempted to assist in implementing and clarifying Law No. 4. Two other working drafts of government regulations related to mineral and coal mining activities, namely a government regulation on supervision and monitoring as well as one on (land) reclamation and post-mining activities, are currently undergoing final review (Kirana and Mufti 2010; Ionasia 2010). The mining sector continues to both impact and be impacted by overlapping and contradictory laws. For example, two-thirds of the nation’s land area is recognized as forest lands (Kawasan Hutan) and is under the control of the Ministry of Forestry. Many of the most commercially viable mineral ores and metals are found in forested areas, particularly in areas that are categorized as protected forests. The Forestry Law No. 41 of 1999 inhibited open-pit coal mining in protected forest areas. Pressure from mining interests and pro- investment interests led to eventual retraction of the law via Presidential Decree No. 41/2004 (Mbendi 2010). Within mining areas, mining licenses may be issued to a business entity (established under the laws of Indonesia), a cooperative, or an individual (including a partnership). Licenses must be issued through a competitive tender process rather than direct appointment (Business Monitor International 2010). Policy and regulatory uncertainties and overlapping land use and property rights in general have created conflicts between mining and forestry concerns, between central and local governments, and between mining interests and local communities. The Ministry of Forestry’s efforts to maintain the functions of protected and conservation forests amidst strong pressures from the business mining sector have created conflict. In addition, all levels of government may issue mining licenses and apply certain levies and charges, thus adding to the confusion and legal uncertainty over mining rights. Finally, local-level conflicts are triggered by the allocation of mining permits or contracts to companies on community or indigenous lands, with land tenure rights at the heart of the problem (Business Monitor International 2010). According to Indonesia’s constitution, the state controls all land. Customary (adat) or indigenous lands are recognized, but only on the condition that their use is not in conflict with national interests. In rural areas of the outer islands, land certificates are not the norm; rather, land rights are recognized traditionally and informally within and among local and/or indigenous communities (Ionasia 2009). Because of license processing difficulties – mainly slow, complicated, and expensive red tape – small scale miners are often reluctant to obtain permits. Thus, they automatically become engaged in mining activities that are considered illegal. Other issues, such as lack of clarity on the role of the informal mining sector, have resulted in violence on several mining operations with illegal occupation by independent miners (Resosudarmo et al. 2008; JATAM 2010). The Ministry of Energy and Mineral Resources oversees the mining sector. After decentralization in 2004, local governments claimed the authority to provide local licenses for small-scale miners, despite the illegality of artisanal mining at the national level (Kuo 2008). Disputes arising from the implementation of mining laws and regulations are settled through national court and/or arbitration in accordance with the applicable regulations (Kuo 2008). A new mining law was adopted in December 2008. In 2006 the government started 110 infrastructure projects, valued at US $16.5 billion, which are expected to encourage more investment in mining by foreign companies (Kuo 2008; Associated Press 2008). In 2010 the Indonesian government invested US $2.5 billion in the mining sector. Investments in mineral resources, coal and geothermal mining are expected to reach US $3.077 billion in 2011, $5.008 billion in 2012, $4.68 billion in 2013 and $7.468 billion in 2014 (AseanAffairs 2010). While speculators assert that, in an effort to reduce carbon emissions by 26%, the government may phase out open-pit coal mining in Indonesia, recent opening up of protected forests to miners may delay this phase-out (AseanAffairs 2010). USAID does not appear to be active in mining reform. Information about other donor-related minerals projects is unavailable.